A big moment for the Kaisers, this album just about passes the pick of the pops test. It still stays too much in their quasi-new wave/indie comfort zone, but the different and interesting bits lend it some allure. Forget the title of this album for now. It has both a spurious origin and something that’s also somewhat more meaningful to the Kaiser Chiefs (and will become clear). Let’s consider the Kaiser Chiefs, a British band of some renown in their homeland and across Europe. Since the Kaisers first came on to the scene proper in 2005, there have been at least three models. The first the hip indie band of “Oh My God”, their first hit . Model mark two was the ubiquitous anthem-punching group of “I Predict a Riot”. The third version was that which seemed comfortable in the pop mainstream, the band of “Ruby, Ruby, Ruby”. But "Ruby" was a hit in 2007, and the last few years have not been halcyon for the band from Leeds. Their last album from 2011, The Future Is Medieval, sank without trace. So it was only a minor implosion when the Kaisers’ drummer – and more to the point, their co-songwriter and co-lead vocalist Nick Hodgson – left the band in late 2012. The Kaiser Chiefs’ problem had become clear long before Hodgson left. They had nowhere to go. They had always seemed a band out of time, more suited to the good Britpop times of the mid-'90s. So, if we re-consider Kaiser Chiefs in early 2014, a new studio album is a seriously big deal. Can they reverse the plunges in sales? Can Ricky Wilson, vocalist and Hodgson’s song-writing partner for a decade, cut it by himself? Most of all, can the Kaisers persuade the record-buying public they actually belong to the 21st century? Two things are striking about Education, Education, Education & War after listening to the first track, “The Factory Gates”. First, they (meaning Wilson) can still write an anthem; second, there’s an attack to their playing which shows they recognise only too well how high the stakes are. The song lacks subtlety, but that’s more than compensated for by the glorious second “Coming Home”. 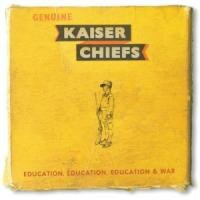 The first single off the album in the UK, it’s one of the best songs Kaiser Chiefs have ever recorded: widescreen panoramic while simultaneously parochially wistful; and slowed just a controlled touch so that Wilson can sing rather than shout. The shimmering guitar could make it a prime U2 '80s album cut, but it has its own identity and the vulnerable edge to the lyrics suggests it means quite a lot to Ricky Wilson (and that maybe parting more with his mate Hodgson was more painful than he's said). “Coming Home” still manages to convey an authentic anthemic feel, and it could have been a template for the rest of the album. Unfortunately that’s not the case, and the next two tracks – “Misery Company” and “Ruffians on Parade” – revert to bog-standard Kaisers: late '70s new wave mixed with average '90s Britpop. “Meanwhile Up in Heaven” is another song slightly slowed down, and instantly more interesting for it. Maybe it’s the Farfisa organ, perhaps it’s the full sound. Whatever, like “Coming Home” it manages to combine an '80s nostalgia feel with something that is contemporary. It also emphasises that Wilson can sing when his voice isn’t straining at declaiming. The rest of the album continues in a bitty way. The tunes remain fairly tuneful (although not overwhelmingly so). The sloganeering allied to marching beats gets a little monotonous. The punky edge is an ever-present. It’s also a reminder that the band have lost something in the shape of Hodgson’s voice – the guy who pre-empted the Arctic Monkeys’ Matt Helders as a singing drummer is much missed in that respect. The one tune to cause a start is the penultimate“Cannons”. From the Black Sabbath “Iron Man”-like growling opening to the perfectly-enunciated spoken word outro from the actor Bill Nighy, it’s Ricky Wilson’s attempt to issue a statement. It certainly sounds like a manifesto, and suggests why the band chose to add the word war to the famous/notorious Tony Blair bluster of “education, education, education”. You suspect Wilson had in mind the bitter anti-war diatribes of Roger Waters; although (bar Nighy), it’s more reminiscent of the Jam’s classic army and establishment piss-take “Eton Rifles” without the cutting edge. "Roses" is a fine track to close. It wobbles and teeters on some brink, it sounds reassuringly uncertain, it presents the Wilson voice in an unusual minor key register. Above all, it is a rest from the declamatory statements and martial beats. Education, Education, Education & War is an album that gets better on repeated listens. That must mean that the best bits – and there are many – increasingly obscure the mediocre parts – and there are several of those too. It’s still not the triumph you suspect the Kaisers so desperately wanted. But they are looking up rather than down; and they’ve created a platform which, given some more experimentation and daring, might take them places next time round.